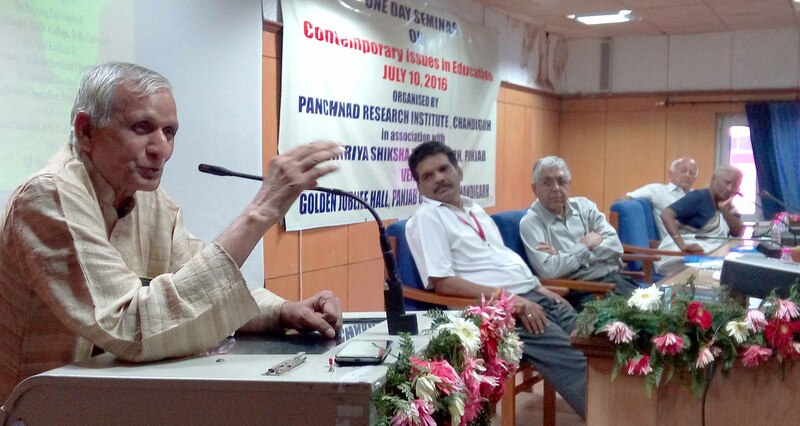 Chandigarh, 10th July : In our country today, Education system should be on the basis of Nature, Culture, Environment, Atmosphere, Scenario, hurdles and curiosity to know something. Said by Sh. Bajrang Lal Gupta, Renowned Economist and faculty of S.N.N college of Delhi University. Sh. Gupta addressed the one day seminar on “Contemporary issues in Education” at Panjab University on Sunday organized by Panchnand Research Institute, Chandigarh and Rashtriya Siksha Vikas Manch ,Punjab. The renowned educationist Sh. Atul Kothari , General Secretary of Shiksha Sanskriti Utthan Trust and Ms. Indumati Kotdare , Chancellor of Punurthhan Vidhyapeeth , Ahmedabad also addressed the seminar. The Chief Guest was Prof. Arun Kumar Grover, Vice- Chancellor, Panjab University. Sh. Gupta said that, basis of development of Education should be Indanising. Indian values , cultural heritage and glorious history in the course should get a comprehensive share. In context of country’s problems and needs in terms of resources consistent social, cultural, economic, political structure should produce skilled people to enhance the education system. Being a most dynamic and developing country India is aspired at global echelon too. So, we should learn from the innovative knowledge of world and Indian system. On this occasion, Mr. Atul Kothari addressed on nationhood in education system. He said that at foremost one should be lucid with the concept of nationhood. There are three integral components of any nation. These are of the terrain, the people and culture of society. The development of Educational system as per the requisite of Operation and development of the nation. The syllabi should inspire Nation’s pride. It should not uprise the feeling of radicals and terrorists. He said that in the school curriculum Sri Guru Gobind Singh is taught as ‘Mansab’ of the Mughal court and Sri Guru Tegh Bahadur as a traitor. Instead of increasing the country’s self-respect it is diverting future generations. He said the Indian wisdom traditionhas been quiet prosperous. Efforts should be made to imapart the studies and findings of great mathematician Sriramanujam, Mr. Bhaskaracharya etc. to new generations. Surprisingly, Mr. Bhaskaracharya significant handwritten math formulas had been written in his three diaries . The recent publication of these diaries were made. He said that any country’s education system should be on the basis of its needs , such as military education is mandatory in Israel. Similarly, India’s education system, experience in social work, time management should comply with the law and elements. He also emphasized on ‘Swadeshi,Swabahsha,Swabusha’ food and family system. Everybody must learn their mother tongue, the country wide communicable language Hindi and treasure of knowledge Sanskrit. Mr. Atul Kothari said that many people are making keen efforts to uplift the country’s educational scenario. Many academic institutions such as, Shiksha Sanskriti Utthan Trust are also working in this direction to envisage the system. He also appreciated the step of CBSE to begin the Vedic mathematics in school curriculum . He said that Kalidas University also have started a diploma course on Vedic mathematics. Similarly, Ms. Indumati gave her speech on Contribution of Education in Human development. In the context of development nowadays the concepts of education are narrow in nature. There are two dimensions of development. First- Growth, secondly- material development.To know the concept of development we should too understand the comprehensive concept of human nature. She said the human- is not only the physical body but it is a unit of body, soul, mind, intellect and the gut. All is as it appears his soul. When we think about the evolution of human beings then think about the development of these all five elements. She addressed that when it comes to the development of the body –it should be healthy, strong, skilled, shapely and must be tolerant. Similarly, the soul of a being must be balanced.Mind should be concentrated, sober and restrained. Intellect should be stunning, spacious, by having sharpness. The scale of the Gut is its purity. The second dimension of the development material development, he should be adjusted with the creation of man and society. The entire society should be ready to think in a competent, happy and a cultured person. The universal aim of education should be Maintenance, operation and creation on a right path. This requires a massive reconstruction of school and higher education courses. On the occasion, a large number of academic intellectuals were present along with the convener Dr. Sanjay Kaushik.